After three and a half years at the top of the US’s law enforcement food chain, James Comey has a few stories to tell. The former head of the FBI is writing a book, reports the New York Times (paywall). But it won’t be filled with dirty laundry; instead, Comey is writing about the decision making and leadership principles that have guided him throughout his career—up through his last job, working for, and being fired by, US president Donald Trump. 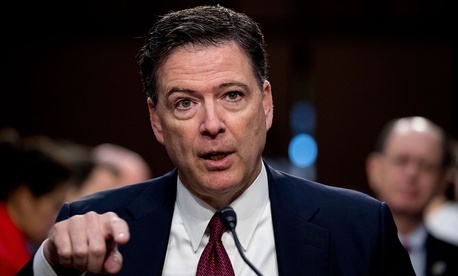 “It’s a book about leadership and [Comey’s] search for truth, informed by lessons and experiences he’s had throughout his career,” Matt Latimer, one of Comey’s literary agents, told the Times. “It will speak to a broader desire in our country for more ethical leadership.” Major publishers will start bidding for the book this week, says the Times. Comey became FBI director in 2013, and in the last year he’s been at the center of two highly public intelligence scandals. One was around presidential nominee Hillary Clinton and emails she refused to make public, and one is still ongoing, around suspected collusion between the Russian government and the Trump campaign. Earlier this year Comey’s abrupt firing by Trump raised serious questions around executive power and the true nature of Trump’s relationship with the Russian government. But it also exposed management and leadership issues: As Quartz and other outlets have pointed out, Comey’s Senate testimony in June showed just how difficult it is to stand up to a powerful boss and how important it can be to document what your boss says. Trump was criticized here and elsewhere for his passive aggressive firing tactics, and after Comey’s testimony, for his “cowardly” use of ambiguous language.